The wild ancestors of today’s garlic, Allium sativum, originated thousands of years ago in what is believed to be garlic’s center of origin, Uzbekistan and Turkmenistan. Garlic spread across the globe as it became a popular vegetable, spice, and medicinal plant. The varieties of cultivars we have today were each selected for favourable traits, whether it was the spiciness of the cloves, tolerance to drought or the average size and number of cloves in a cluster. Garlic has been reproduced clonally— by the separation of cloves— for hundreds if not thousands of years. Scapes, the leafless flowering stem rising directly from a bulb seen in hardneck garlic, was removed to deter the plant from sinking energy into the bulbils and instead divert the energy into the cloves. As a result, flower production is greatly reduced or even absent in some cultivars and most garlic clones are sterile. It was not until the 1980s that male fertile varieties were confirmed, and the few varieties that were fertile had a large variation in flower morphology, timing, stigma position as well as the number of flowers. True seed garlic can be produced by crossing these varieties and research is being conducted to develop new breeding lines. In Ontario, the cultivars planted are sterile and the scapes are generally removed sometime in June. Research conducted by John Zandstra at the University of Guelph Ridgetown Campus has shown that the timing of scape removal directly influences the resulting yield of the crop and average size of the bulb (Figure 1). These results indicate that it is advantageous to remove the scapes as soon as possible to reduce any negative impact on yield with a potential yield increase of 20-30% or more when removed by hand. However, this yield improvement is not always true if a sickle bar mower running above the crop is used to remove the scape. Sickle bar mowers greatly reduce the amount of labour that is required for scape removal, but it comes with a cost. Often leaves are cut in the scape removal process and by removing only one leaf, bulb sizes were reduced by 13% and the yield was reduced by an average of 17.5%. Yield was greatly impacted as the number of leaves cut during mowing increased. If the top two leaves were cut, the yield was reduced by approximately 25% (Figure 2). Therefore, it is best to remove scapes by hand as soon as they emerge from the stem. 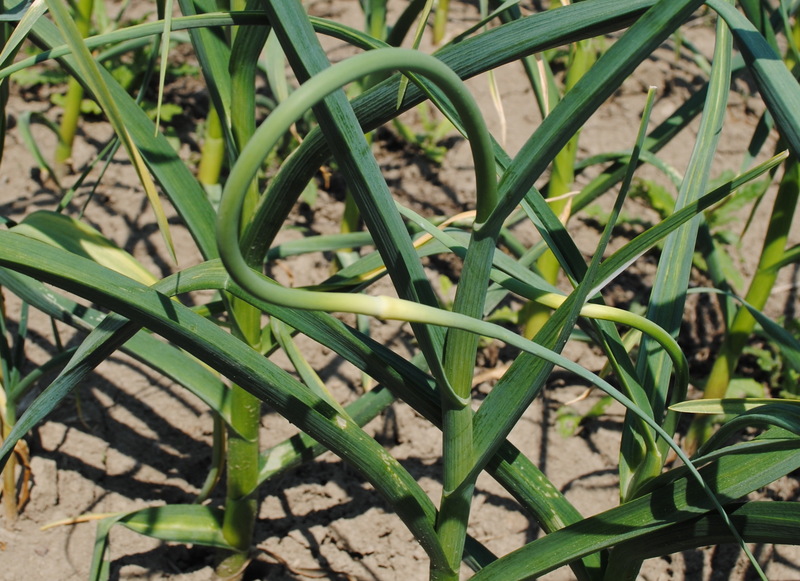 If garlic scapes are to be removed mechanically, it is better to allow the scapes to grow 30-40 cm long in order to reduce the chance of removing leaves when a mower is used. Otherwise, leaving the scape intact might be the better option to limit the overall amount of yield loss.